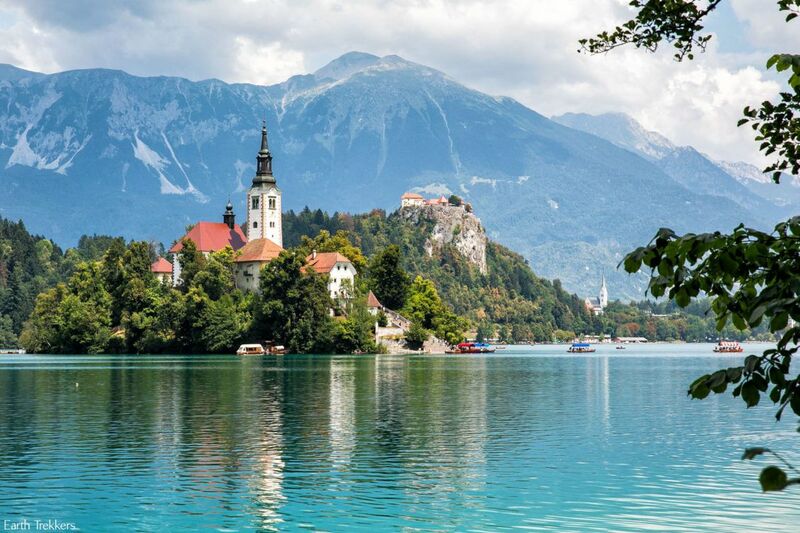 Lake Bled is one of the most picturesque spots to visit in Slovenia. 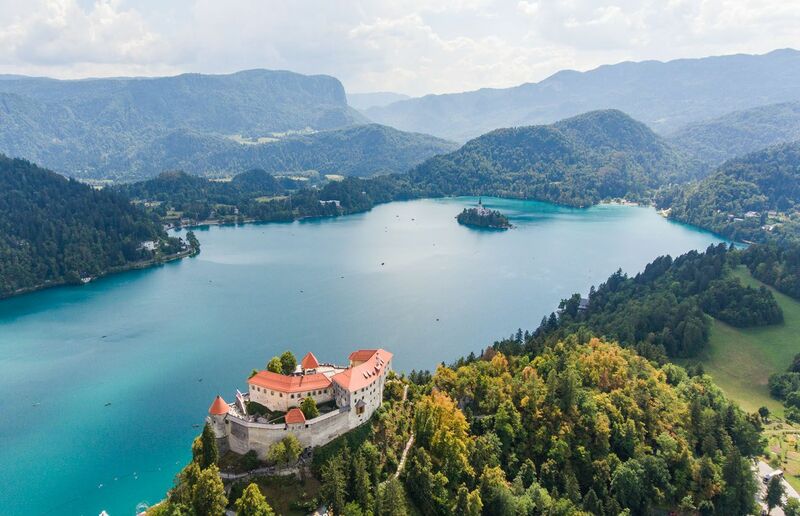 This small lake has all of the ingredients for the perfect getaway…a castle perched high on a hillside, a pretty little island to visit, hiking trails, secluded swimming spots, and a fantastic sweet treat. 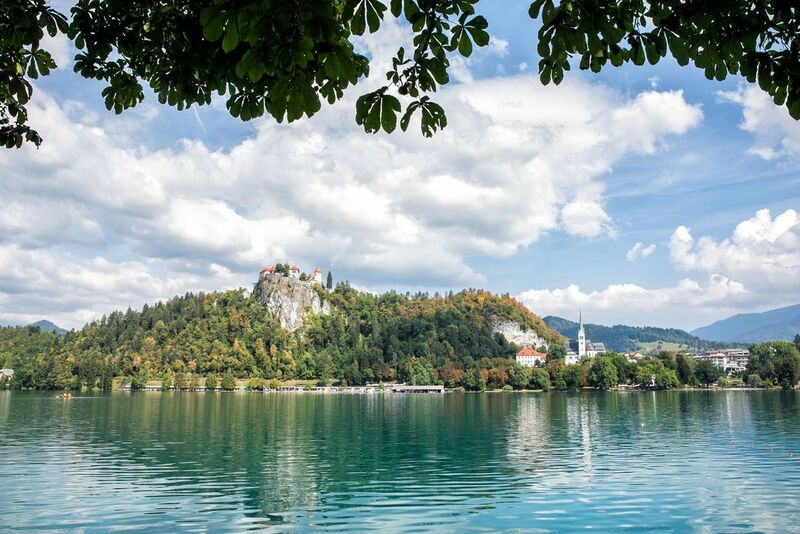 Here are 8 of the best things to do in Lake Bled. Bled Island is the centerpiece of Lake Bled. 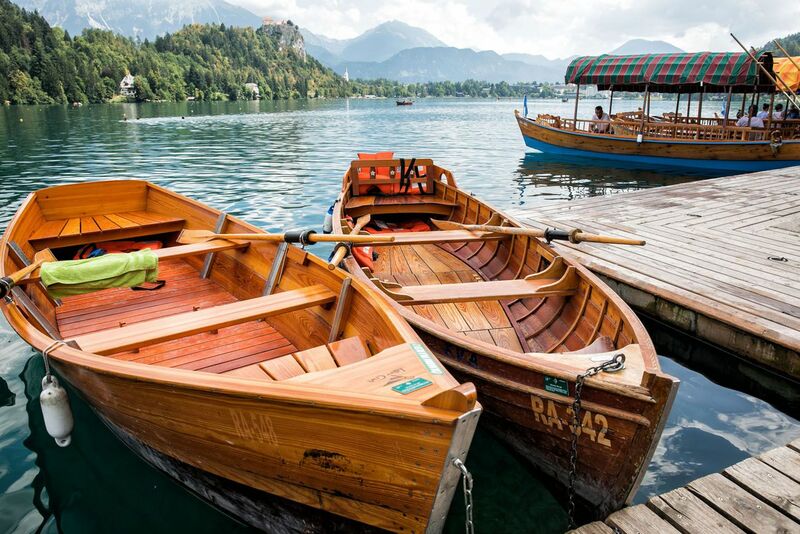 To get here, you will have to get out on the water…and this is one of the best experiences to have at Lake Bled. For those feeling adventurous, you can rent a rowboat and paddle out to the island. Tim happily volunteered to be our rower. Meanwhile, Tyler, Kara, and I got to sit back and enjoy the view. Once at Bled Island, we were instructed to dock our rowboat on the far side of the island (opposite the huge staircase). Tie up your boat and then take your time exploring the island. There are several shops located around the lake that will rent paddleboats by the hour. We rented our rowboat from a small shop called Pletna B&B (location on Google Maps: 46°21’37.5″N 14°05’58.7″E).It costs €20 per hour to rent a rowboat. You don’t need prior experience to do this, but the boats can feel wobbly and unstable at first. It takes roughly 15 minutes to row from shore to the island. But it’s also great exercise. Plus, whoever rows the boat gets an extra piece of Bled Cream Cake! This entire round trip visit to Bled Island took about one hour. For Tim and I, this was our favorite experience at Lake Bled. If you just want to sit back and enjoy the ride, you can hire a pletna. These larger boats hold up to twenty people. Expect to pay about €12 per person. Most pletnas dock at the 99 steps leading to the Assumption of Mary Church. As you approach Bled Island, most likely you will hear the church bells ringing over and over again. What you are hearing is everyone ringing the bells to have their wishes come true. There is a legend that whoever rings this bell will have their wish come true. The story goes that 500 years ago a widow had a bell made in memory of her husband. While the bell was being transported across the lake, a storm struck Lake Bled, sinking the boat, the bell, and everyone on board. The Pope consecrated a new bell and that one was successfully installed in the church. Now, when you ring this bell, you are showing honor to the Virgin Mary and your wish will come true. After ringing the bell, you can also climb the bell tower. We were hoping for a nice view from the top of the tower, but honestly, it wasn’t anything great. A popular thing to do here is to walk around Lake Bled. The total distance is 6 km and it takes roughly an hour and a half, longer if you stop frequently. The views are gorgeous and along way you may come across some very pretty swimming spots. The views from the south side of the lake to Bled Castle are amazing. I also really liked the walk along the western side of the lake. Now, you are on trail under the cover of trees, away from the cars and congestion of the road that runs along Lake Bled. Plus, the view out to Bled Island from here is one of the best! For more than 1000 years this castle has sat on these cliffs, enjoying one of the best views of Lake Bled. This is the oldest castle in Slovenia, dating back to 1011. On a visit here, enjoy the spectacular view over the lake from the terrace, tour the museum, and go wine tasting in the wine cellar. Want to dine with a view? Have lunch or dinner in the Bled Castle Restaurant. 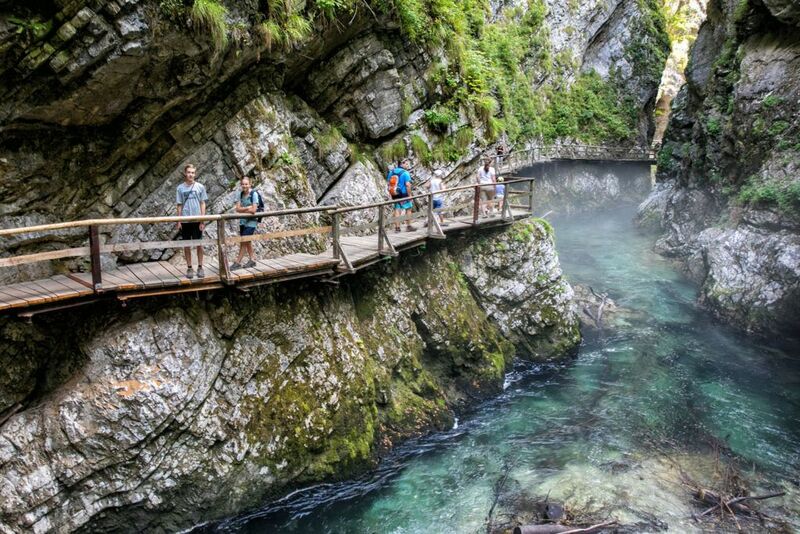 For one of the best views of Lake Bled, hike to Mala Osojnica. 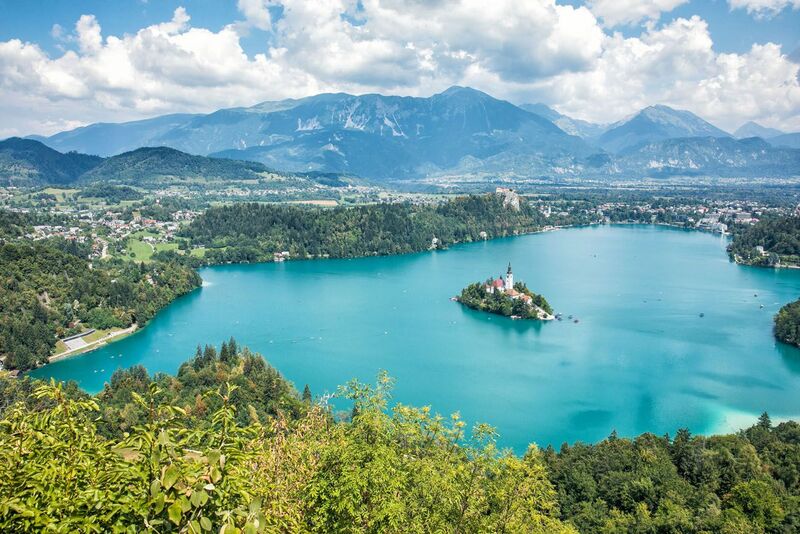 It’s a quick hike, a little bit on the strenuous side, but your reward is the iconic, aerial view of Lake Bled. The trail climbs steadily up to the viewpoint. Most of the time you are under the cover of trees. 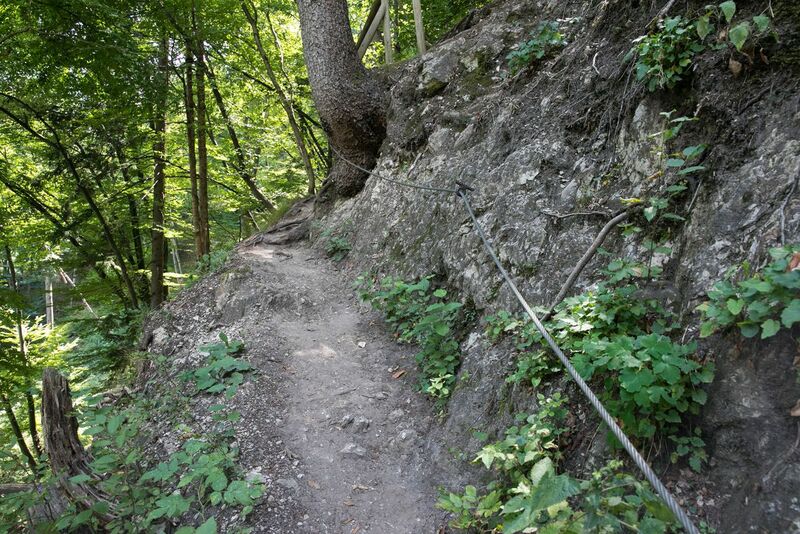 There will be short sections of wooden steps and there is short scramble along the trail using chains. 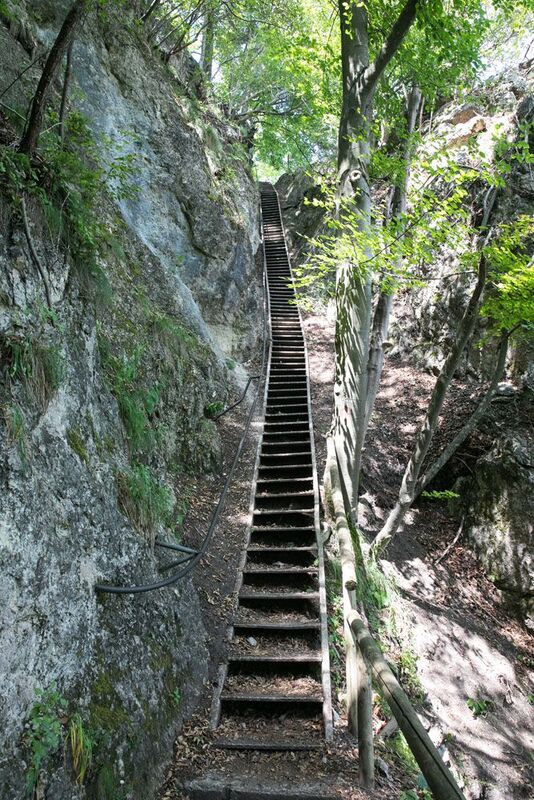 You know you are getting close to the top when you see this long, metal staircase. At the top of the staircase there is a wooden bench and a gorgeous view of Lake Bled. If you keep going just a little bit farther (about 5 more minutes of hiking), you arrive at Mala Osojnica, the main viewpoint. Beyond this point the trail keeps climbing. However, I turned around at this point. The entire hike takes 45 minutes to one hour round trip (longer if you sit and enjoy the view). You do not need hiking shoes although a sturdy pair of shoes like running shoes are recommended. From spring to autumn you can go for a ride on the Straza Bled toboggan track. This is a fun spot for kids (and kids at heart). You ride up to the top of the hill in a chair lift and speed down the hill on the toboggan, enjoying the views of Lake Bled as you go (if you can take your eyes off the track!). This was Tyler and Kara’s favorite experience at Lake Bled. What a gorgeous place to rent paddle boards! 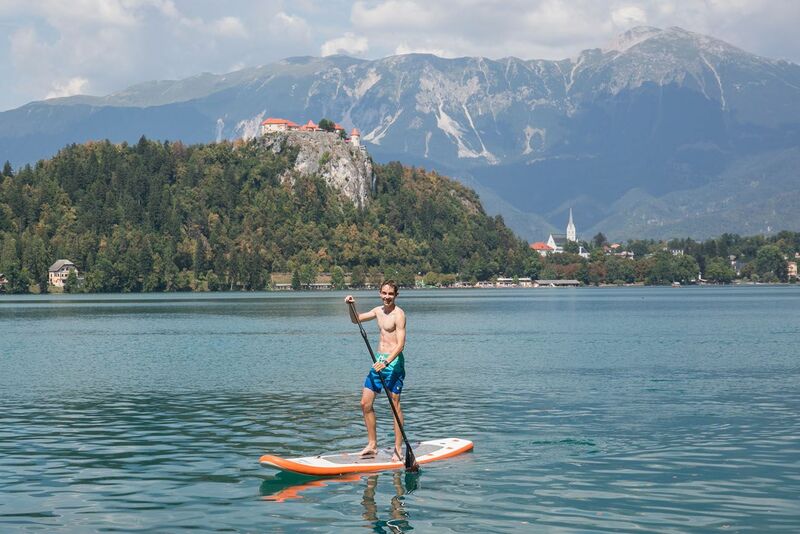 You can paddle around Bled Island and explore the coastline of the lake. There are several locations to rent paddle boards. We rented paddle boards at a dock on the southwestern side of the lake, near Vila Bled. They charged €10 per hour per board. While Tyler and Kara were out paddle boarding, Tim and I relaxed at a small, lake front café and indulged on Bled Cream Cake and Union beer. 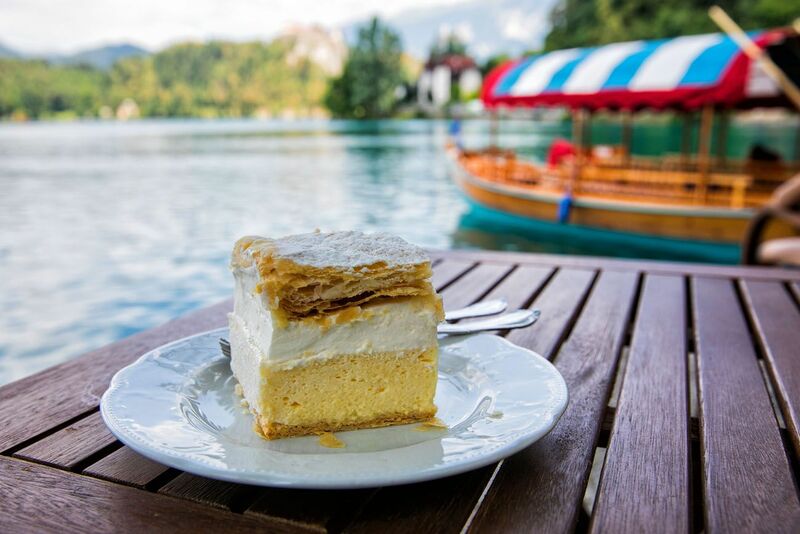 Bled Cream Cake is the regional dessert and worth trying while you are here. Normally, I don’t like this type of thing, but I thought it was delicious!! 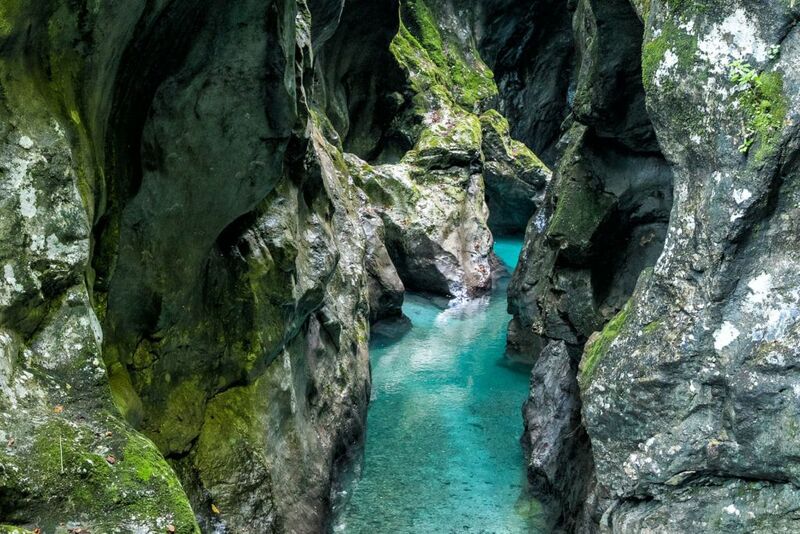 Vintgar Gorge is a must while you are at Lake Bled. 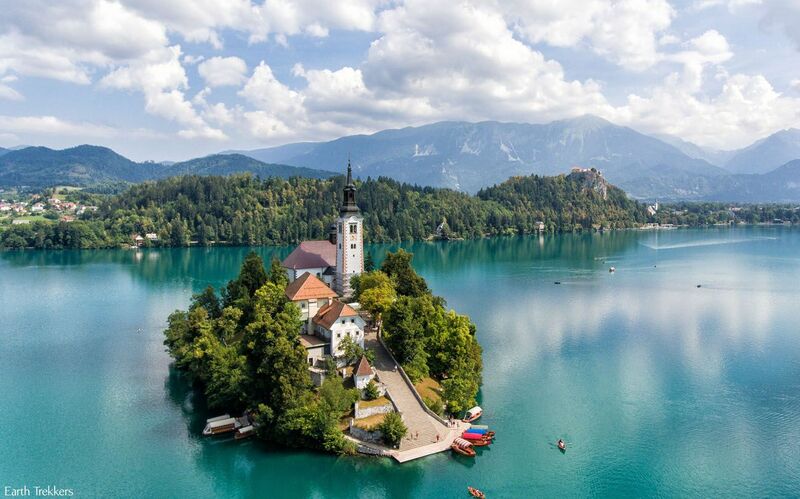 It’s not located at Lake Bled (it’s a 10 minute drive to get here), but it’s well worth taking a trip here, even if you only have one day to tour Lake Bled. For 1.6 km you walk on elevated boardwalks along the Radovna River. It’s gorgeous, it’s easy to do, and it’s fun for the entire family. Also worth a visit is Lake Bohinj, just a short drive down the road from Lake Bled. Yes, it’s another lake, but it’s a very different experience. 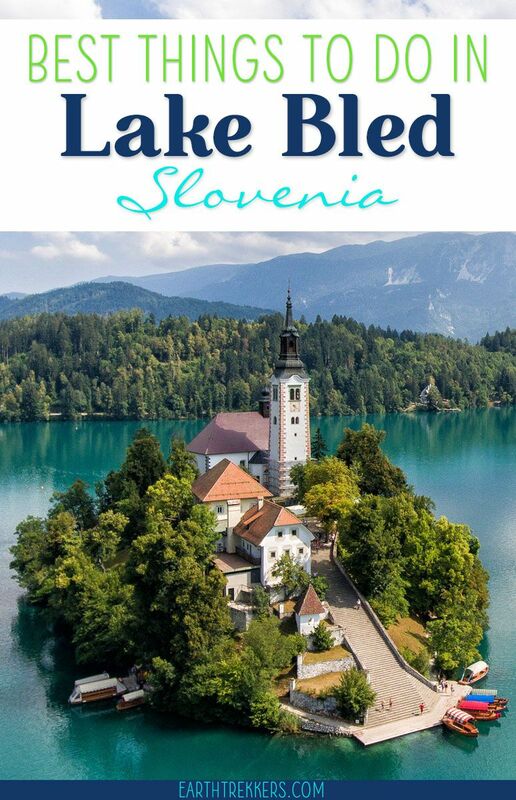 Are you planning a trip to Lake Bled and Slovenia? Comment below if you have any questions! Thank you for your blog! We consult it every time we take a trip or need inspiration for where to go next. We were especially happy with your recommendation to visit Brother’s Point on the Isle of Skye and the Skye Pie Cafe (so good!) This was a highlight of our trip to Scotland last summer and my kids talk about it all the time. We’re headed to Slovenia this July, so I was wondering what time of year you were there. 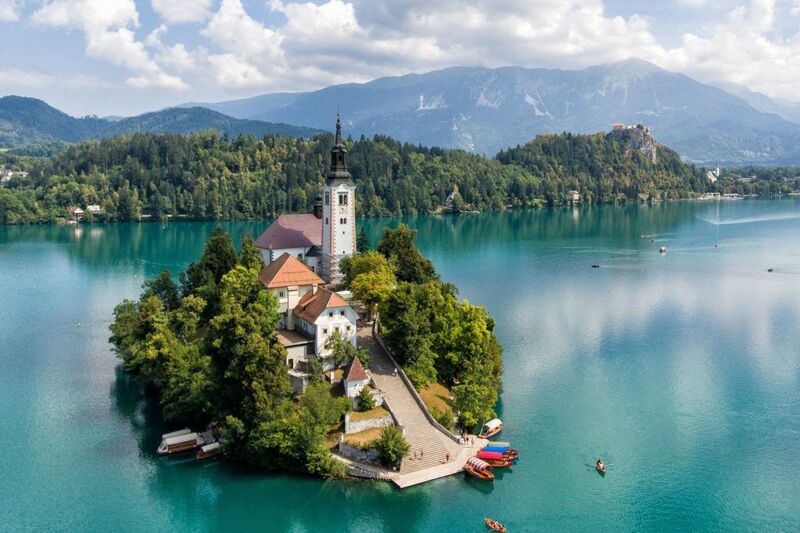 I’m especially concerned about how easy it will be to rent a boat on Lake Bled or with visiting the Vintgar Gorge, which I heard can get really crowded. We don’t usually travel in July, so I’m a little nervous about it since I really hate crowds and long lines! We’re going to be skipping Postojna Caves in favor of Škocjan on your recommendation for just that reason. Your photos don’t make it seem crowded at all though, which is why I was curious about when you went. Thanks! My daughter is going on a swimming holiday for 4 days and has asked me to come long to look after her one year old child. Will there be places for me to walk to and spend time looking after him?